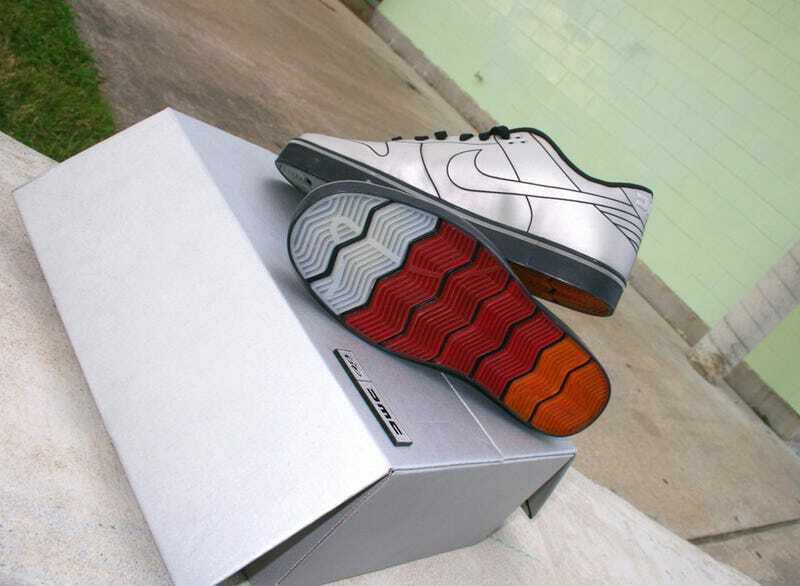 Judging by the emails from people dying to know where to buy them, the DeLorean Nike Dunk 6.0 shoes are this season's hot car-inspired fashion accessory. They go on sale this Friday, but I'm wearing a pair right now, suckas. 1. They are dunks, but they will not help you dunk. 2. They say Belfast on them, but they were not made in Belfast. 3. If you can run 88 mph you will not go back in time, but you'll still be running 88 mph. Which is pretty cool. 4. There's no secret pocket for transporting cocaine. Clearly, the shoes are meant as nostalgia for the car itself and not the Back To The Future films (those shoes do exist), which suits me just fine. Mars Blackmon explains why I can't dunk. Despite not letting you travel through time or dunk like Russell Westbrook, the shoes are wonderful. Designed to mimic the stainless steel finish of a DMC-12, the "no-sew" material offers a matte finish unlike anything I've seen on a shoe before. It's understated but fantastic. Out back, the embossed DMC stamp sits above a louvered pattern also inspired by the car cars rear windows. The bottom of the shoe is pure fantasy, with the red-white-and-yellow taillight pattern preserved on the outer sole. Not sure why they didn't grid it off, but it's another example of giving a shout out to the car while still retaining its own unique identity as footwear. Like the even more limited-edition press box itself, the eyestay's are another slight nod to the DMC-12's iconic gullwing doors. My favorite part is the Belfast stamp on the tongue, a sly reference to the car's being constructed in Ireland and perhaps the only shoe in a long line of shoes named after geographic locations (Mexico 66's, for example) to be named for the Irish town. It's almost a shame to wear them as the material slightly deforms when you do — the only drawback to the look. Also, if I hadn't unboxed them I could be selling my review pair on eBay right now like this guy, but my integrity is worth slightly more than $349.99. Full Disclosure: Nike/DMC did send me a copy, but I'm not going to sell them as that would be unethical. And keeping them locked up will only make me want to sell them in the future. So I'm going to wear them. Suckas.